Washington Blue Lion senior Richie Burns, at right (No. 23) reacts as his game-winning shot falls through the net at Miami Trace High School Saturday, Feb. 9, 2019. Also pictured (l-r); Austin Brown of Miami Trace, Blaise Tayese and Omar Porter of Washington and Dylan Bernard of Miami Trace. Washington senior Blaise Tayese takes the ball to the basket during the rivalry game at Miami Trace High School Saturday, Feb. 9, 2019. Tayese led the game with 15 points and 13 rebounds (including 10 offensive). 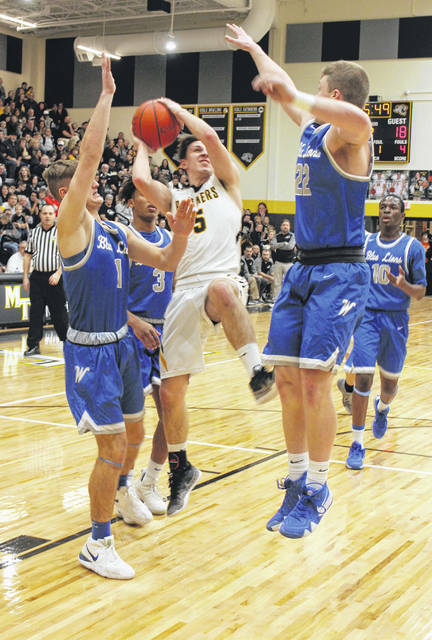 Pictured for the Panthers are: (l-r); sophomore Cameron Moore, sophomore Logan Rodgers, senior Austin Brown and (in behind him), junior Kyler Conn.
Miami Trace’s Logan Rodgers approaches the basket, guarded by Washington’s Richie Burns during the rivalry game at the new Miami Trace High School Saturday, Feb. 9, 2019. Pictured at right are (l-r); Washington’s Blaise Tayese and Miami Trace’s Austin Brown. Miami Trace senior Austin Mathews drives between several Washington players Saturday, Feb. 9, 2019 at Miami Trace High School. Pictured for Washington (l-r); junior Eli Lynch, senior Evan Upthegrove, junior Drew Moats and senior Blaise Tayese. Miami Trace senior Austin Brown (right) is guarded by Washington junior Miguel O’Flaherty during the first rivalry game in the new Miami Trace High School Saturday, Feb. 9, 2019. 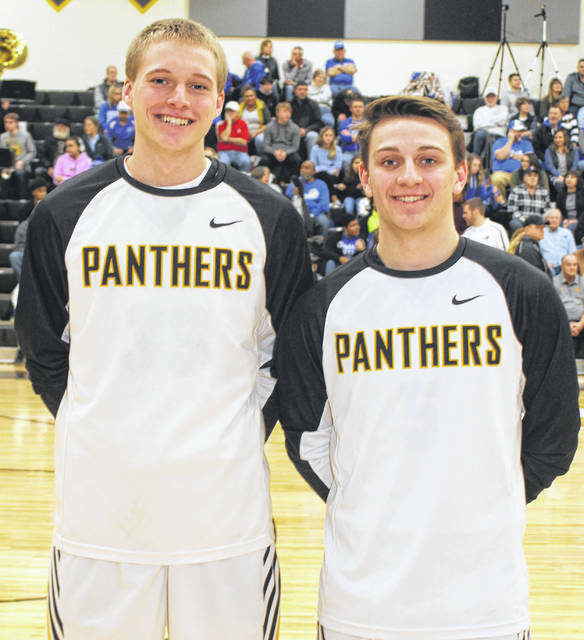 It was senior night Saturday at Miami Trace and among the seniors honored were Panther basketball players Austin Brown, left and Austin Mathews. Miami Trace junior Kyler Conn (at left) is about to pass the ball to a teammate on the perimeter while guarded by Washington senior Omar Porter during the rivalry game at Miami Trace High School Saturday, Feb. 9, 2019. 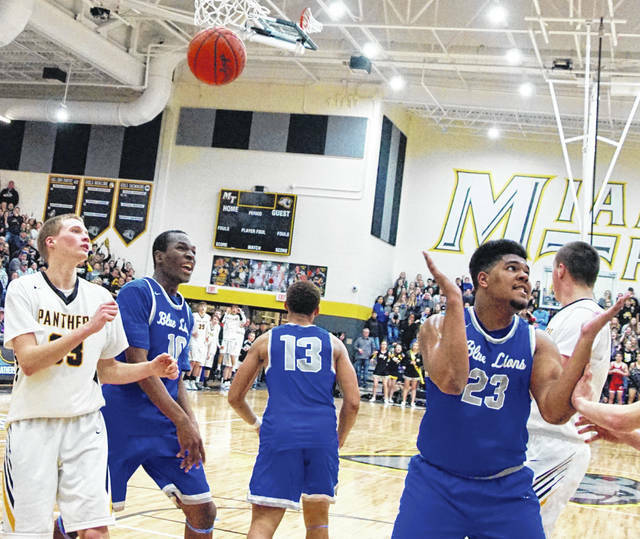 There were two tremendous, barn-burning rivalry basketball games played at the new Miami Trace High School Saturday, Feb. 9. The gym was already filling up fast by the time the first game, the boys j-v game, was over. The new gym was probably filled to somewhere around 90 to 95 percent (maybe more) capacity by the time the Blue Lions and Panthers took the floor for their warm-ups Saturday evening. The game stayed close throughout with the Blue Lions earning a hard-fought 50-48 victory. 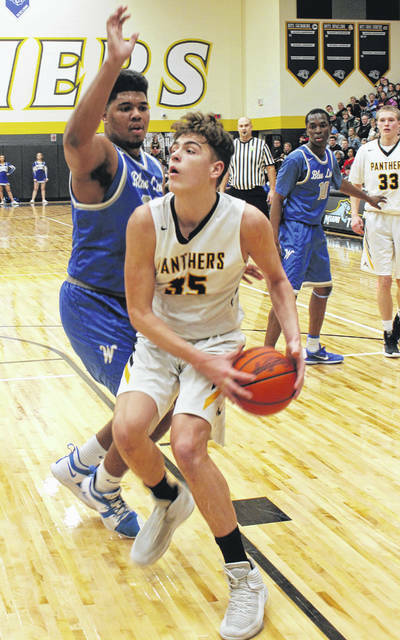 With the Panthers trailing by three points, and time running out, Miami Trace junior Kyler Conn hit a bucket and was fouled, creating an almost deafening sound that would have made for an interesting reading had there been a decibel meter to measure the effect. Conn was fouled and hit his free throw, tying the game, 48-48 with 10 seconds to play. The Blue Lions went down court, took a shot and missed, but senior Richie Burns got the ball and put it back up and in as time expired. Washington senior Blaise Tayese was the game’s leading scorer and also the leading rebounder in the contest with 15 points and 13 rebounds, including a season-high for Washington of 10 offensive rebounds. 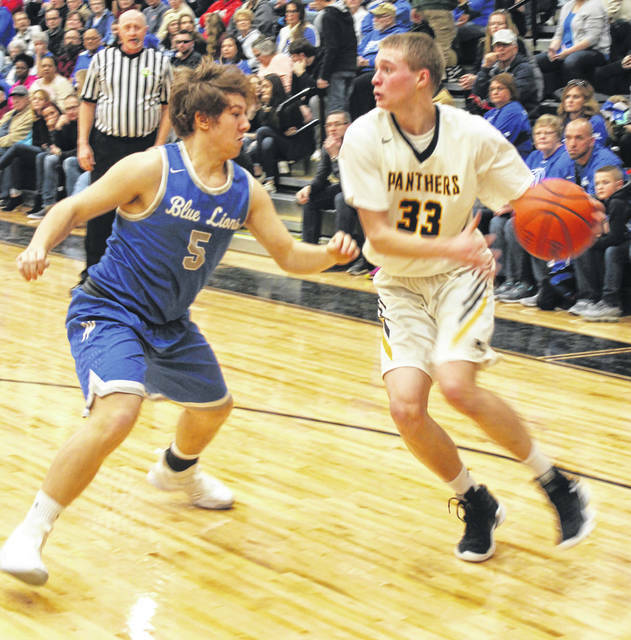 Kyler Conn led the Panthers with 14 points. He also led Miami Trace with three steals and five assists. Senior Evan Upthegrove had 12 points for Washington and grabbed four rebounds. Miami Trace sophomore Logan Rodgers hit three three-point field goals and scored a total of 10 points. He led the Panthers with seven rebounds. Richie Burns scored 10 points and had four rebounds. Junior Trevor Barker had 10 points, three rebounds and two steals for Miami Trace. The Blue Lions took a 6-2 lead to start with a pair of threes from junior Garitt Leisure. Rodgers had two threes to put the Panthers in front, 12-8. With an offensive rebound and put-back by Tayese, Washington trailed, 12-10 with 3:50 remaining in the first quarter. Barker hit a pair of free throws and Rodgers hit another three to give the Panthers a 19-12 lead at the end of the first quarter. Some of the keys to the game included both teams not shooting well from the free throw line. The Blue Lions were just 5 of 15 for 33 percent and the Panthers made 8 of 16 free throws for 50 percent. The Blue Lions had the decided edge was second chance points. With 15 total offensive rebounds, Washington turned that into 18 points. The Panthers had just two points after one of their eight offensive rebounds. Washington had 16 turnovers to 10 for the Panthers. 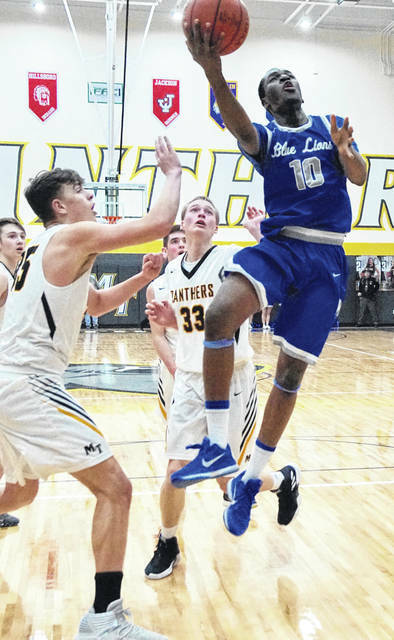 Still, the Blue Lions converted 13 points off turnovers to two for Miami Trace. Washington outscored Miami Trace 10-5 in the second quarter to trail, 24-22 at halftime. The third quarter was the best for the Blue Lions as they went on a 9-4 run to start the period and ended up outscoring the Panthers, 18-7 to go in front, 38-31 with eight minutes remaining. The Panthers began the fourth quarter with an 8-3 run to pull to within four points, 43-39 with 4:22 remaining in the game. 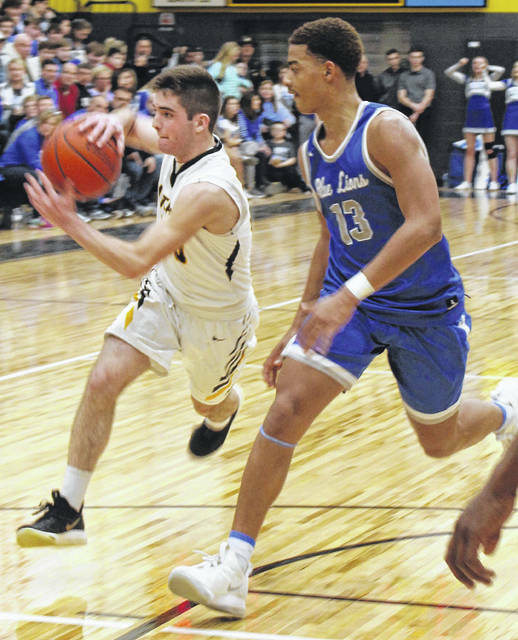 Upthegrove hit a bucket for the Blue Lions and Conn had a steal and scored; Leisure scored for Washington and Dylan Bernard had an offensive rebound and put-back to put the score at 47-43. Washington went to the free throw line with 36.8 seconds remaining and missed the front end of the one and one opportunity. Barker hit a lay-up for the Panthers to make it 47-45. The Panthers fouled again with 25.3 seconds to play. This time the Blue Lions made 1 of 2 free throws for a 48-45 score. Tayese had another offensive rebound and was fouled, but was 0 of 2 from the line, leaving the door open for the Panthers with 22.2 seconds remaining. It was on the next possession that Conn scored and was fouled, converting the old-fashioned three-point play to tie the game with 10 seconds remaining. Washington took a shot and missed. Burns got the ball and put it back up and in near the buzzer for the 50-48 final score in favor of Washington. “It was an outstanding game,” Miami Trace head coach Rob Pittser said. “I’m super, super proud of our kids. We thought, as a staff, that we had the correct plan and the kids executed it to perfection. “We made some shots early that allowed us to build a seven-point lead,” Pittser said. “They came roaring back, doing what they do best. “Kyler played an outstanding game,” Pittser said. “He’s grown so much in this last third of the season. He took great care of the ball, kept us in our sets, played point guard when he got in the lane. All the kids were outstanding. They stuck to the plan, marvelously so. “Hopefully we can continue to play better against Lynchburg Tuesday night,” Pittser said. “That’s what a rivalry game is supposed to be,” Washington head coach Connor Scott said. “That was the loudest I’ve ever heard a gym. Ever. “I think Blaise may have had 10 offensive rebounds (he did) and he’s 6-foot-3. It’s not like he’s 6-8. He just plays at 100 percent the entire game. “We played eight guys tonight and all eight performed their roles,” Scott said. “Drew Moats comes off the bench and we go on an 8-0 run. Eli Lynch comes off the bench and guards really well for us. Richie’s in foul trouble in the first half and then has an incredible second half. “That was a team win and goodness, gracious, that was fun,” Scott said. “We had to fight through that first surge of their energy with their fans. They came out and not only were they playing harder than us, they were making shots. They are a much better team than their record shows. I thought they made a lot of really, really good plays that younger guys don’t normally make. After Conn tied the game in dramatic fashion, Scott described what happened next. “There’s always that debate of whether you call a time out or not,” Scott said. “I like our athletes more than I like my coaching, so I decided, let’s let Evan make a play. Washington (now 13-6 overall) is at Fairfield (Leesburg) this evening at 6 p.m. The Blue Lions have two additional games to make up: Thursday at Grandview Heights and Saturday at McClain. Miami Trace (2-19 overall) is back at home today against the Mustangs of Lynchburg-Clay High School. The freshman game starts at 4:45 p.m. The Washington Lady Blue Lions varsity basketball team will play Waverly in the Sectional tournament Thursday, Feb. 14 at 6:15 p.m. at Adena High School near Frankfort. The winner of that game will be a Sectional champion and will advance to the District semifinals for a game to be played Thursday, Feb. 21 at 8 p.m. at Southeastern High School against the winner of Meigs vs Athens. The Washington Blue Lions boys basketball team is a No. 3 seed in the tournament and will play Unioto for a Sectional championship and a trip to the Convo at Ohio University in Athens Friday, Feb. 22 at 8:30 p.m. The winner of that game would play in the District semifinals at the Convo Thursday, Feb. 28 at 8 p.m.
Tickets for the Washington girls and boys Sectional basketball games are on sale at the high school this week, from 8 until 11 a.m. and from 1 until 3 p.m. in the Athletic Office. You must enter through the fish bowl gymnasium entrance. Tickets are $5 each and the school gets to keep 25 percent of the proceeds from pre-sale tickets. Tickets for the girls Sectional basketball game on Saturday, Feb. 16 at Adena High School will be on sale in the Main Office of the Old High School from 9 a.m. until 2 p.m. Tuesday through Friday of this week. All tickets are $5. The girls play McClain at 2:45 p.m. at Adena H.S. Tickets for the boys Sectional basketball game on Tuesday, Feb. 19 at Ross Southeastern High School will be on sale in the Main Office of the Old High School from 9 a.m. until 2 p.m. Tuesday through Friday of this week and Tuesday, Feb. 19 from 9 a.m. until 2 p.m. in the Main Office of the new high school. All tickets are $5. The boys play Hillsboro at 6:15 p.m. at Ross Southeastern H.S. If attending the games, please buy from the school, as the school gets to keep a percentage of each ticket sold locally. MIAMI TRACE — Kyler Conn 4 (1)-3-14; Logan Rodgers 1 (3)-0-11; Trevor Barker 1 (2)-2-10; Austin Mathews 2-2-6; Austin Brown 2-1-5; Dylan Bernard 1-0-2; Cameron Moore 0-0-0. TOTALS — 11 (6)-8-48. Free throw shooting: 8 of 16 for 50 percent. Three-point fiel goals: Rodgers, 3; Barker, 2; Conn. Field goal shooting: 17 of 46 for 36 percent. Three-point field goal shooting: 6 of 15 for 40 percent. Rebounds: 26 (8 offensive). Assists: 10. Steals: 6. Blocks: 3. Turnovers: 10. Personal fouls: 13. Bench points: 2. Second chance points: 2. Points off turnovers: 2. WASHINGTON — Blaise Tayese 7-1-15; Evan Upthegrove 4 (1)-1-12; Richie Burns 4-2-10; Garitt Leisure 1 (2)-0-8; Omar Porter 2-1-5; Eli Lynch 0-0-0; Miguel O’Flaherty 0-0-0; Drew Moats 0-0-0. TOTALS — 18 (3)-5-50. Free throw shooting: 5 of 15 for 33 percent. Three-point field goals: Leisure, 2; Upthegrove. Field goal shooting: 21 of 52 for 40 percent. Three-point field goal shooting: 3 of 16 for 18 percent. Rebounds: 37 (15 offensive). Assists: 8. Steals: 6. Blocks: 0. Turnovers: 16. Personal fouls: 16. Bench points: 0. Second chance points: 18. Points off turnovers: 13. Please see Wednesday’s Record-Herald for a report and photos from the Miami Trace vs. Washington girls game held Saturday night. That was the second of two barn-burning games played at the new Miami Trace High School Saturday and Miami Trace came away with a 35-33 victory.